CREA9 XTREME is an innovative creatine complex with exceptional anabolic and ergogenic potential. A combination of nine highly bioavailable forms of the substance in a single formula makes it easier to saturate muscles with active creatine faster and to a greater degree. As a result, ATP resynthesis occurs at a higher rate, and muscle fibres are supplied with more energy to work intensively. CREA9 XTREME helps you grow extremely powerful muscles, free of fat tissue. Creatine is without doubt one of the strongest and most effective legal anabolic substances. This is one of the few supplements that interfere directly in the cellular energy system increasing its efficiency. This is why creatine has been and still is the subject of innumerable scientific studies. Its huge potential was very quickly noticed by specialists in nutrition and in support for sportsmen. This was the beginning of the golden era of creatine supplementation. Why is it so effective? Creatine is produced in our organism in a natural way and stored in our muscles. During increased demand for energy active phosphocreatine rapidly gives away its phosphate part, regenerating the cellular ATP pool and allowing the sustaining of intensive physical effort. Scientists discovered that creatine when taken orally is absorbed from the digestive tract and through blood circulation reaches the muscle cells. It gets inside across the cell membranes and allows increasing the muscle creatine level by as much as 30%. What is the result? A spectacular increase in power and energy available during the physical effort. The additional saturation with creatine gives an unusually strong anabolic signal and leads directly to an increase in the rate of protein synthesis in the muscles and thus to an increase in the lean body mass. The path taken by creatine after its administration before it reaches muscles to some extent resembles a steeplechase. As any orally taken component, creatine also has to overcome three serious barriers. The first of them is the barrier of solubility – the amount of creatine which dissolves in the digestive tract determines to what extent it will be absorbed. The next barrier is the changing pH – already in the stomach we meet a highly acidic milieu in which the creatine particle looses its stability. The main danger here is the so-called cyclisation – in low pH the ends of the linear creatine particle may join and create a ring (creatinine). This compound looses its activity irretrievably and is removed from the organism with urine and this may result in kidney overload. The third barrier to be overcome by creatine is the cell membrane which allows creatine to get inside the muscle cells. This is why scientists have decided to improve creatine by creating its new forms and joining it with other compounds. Why are they more effective? Firstly, they dissolve well, and this facilitates their absorption, secondly, the combination of creatine with other particles increases its resistance to changing conditions in the digestive tract. Thanks to this more creatine reaches the place of its actual activity – the interior of muscle cells. Each conjugated form of this supplement (combination of creatine and another particle) has different kinetics of absorption and different additional properties. The time from the beginning of the cycle to the maximum saturation with creatine is different, therefore the maximum increase in muscle strength and mass may be observed in different time. What to do in order to make the supplementation with creatine even more effective? This question is of interest not only for scientists, but also the sportsmen themselves. How can the ideal creatine supplement be prepared? What should be done so that it is very well absorbed but also rapidly saturates the muscles with creatine? What can be done to keep the creatine level high for a long time and to make the anabolic effects of creatine not only spectacular, but also durable? This question was addressed by the specialists from TREC NUTRITION. Thanks to hundreds of hours of intensive work and analysis of recent scientific research on advanced forms of creatine they developed a unique formula. By using the maximum synergy of the best creatine forms in the world they have created CREA9 XTREME. This preparation presents an innovative approach to creatine supplementation. Due to the combination of its various forms with diverse kinetics the product has unique properties. CREA9 XTREME is an extremely effective activator of explosive power and muscle mass. Precisely selected doses of as many as 9 best creatines were composed in a way that maximises the effects of the supplement cycle. CREA9 XTREME contains raw materials of the highest quality and the most active, bioavailable and stable chemical forms of creatine. Due to this composition the effects of supplementation are not only much better but also more durable, already in small doses. You don’t have to swallow handfuls of tablets or many measures of powder – it is enough to take 3 capsules twice daily, because CREA9 XTREME is an unusually powerful product. Faster than classic preparations it saturates the muscles with creatine and the increased level of creatine is maintained for a longer time. With CREA9 XTREME the supplementation with creatine becomes not only much more effective, but also more economic. 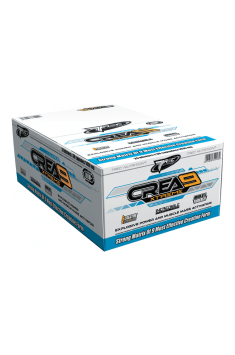 CREA9 XTREME owes its tremendous anabolic power to the fusion of the 9 best forms of creatine. Thanks to the application of KING SIZE technology each capsule contains as much as 1250 mg of perfect creatine matrix - CREA-9 HYPER FUSION. Among the forms of this natural anabolic compound developed by the best scientific laboratories we chose those most stable and bioavailable and which increase the intracellular level of creatine and the upper limit of ATP most effectively. We used the perfectly soluble creatines combined with organic acids which are the natural intermediates of energy pathways: creatine citrate, tricreatine malate and creatine alpha ketoglutarate. The composition wouldn’t be complete without the very well known micronized monohydrate. The composition of CREA9 XTREME also contains the innovative creatine hydrochloride, one of the most concentrated forms of this component. CREA-9 HYPER FUSION also contains the creatine ethyl ester – highly anabolic and stable in a low pH. In order to increase the level of useful energy and the absorption of the product its composition also contains the combination of creatine and glucose – creatine gluconate. This is an incredibly stable particle with additional energy potential. The entire composition is topped with the effective creatine orotate. The orotic acid streamlines the transport of creatine to muscle cells and within those cells it provides intermediates for the synthesis of purine bases. They form the basis for synthesis of new ATP particles. CREA9 XTREME is an extremely powerful creatine preparation recommended as the universal ergogenic and anabolic agent. It may be used both by beginners and advanced sportsmen. CREA9 XTREME generates an increase in lean body mass and allows attaining a significant improvement of power and increase in energy levels during training. The preparation is recommended both in the periods of body mass building and during cycles targeting strength increase in bodybuilders and strength athletes. CREA9 XTREME is also an excellent creatine facilitating the training progress in those going for strength and endurance disciplines like martial arts and team sports. I portion (2 capsules) 30 minutes before training, II portion immediately after training. I portion (2 capsules) in the morning after waking up, II portion before sleep. Using creatine is recommended both to beginners and advanced sportsmen as well as physically active people. The newest research show that the best option is around-training supplementation only on workout days without the division into cycles. The best results will be achieved when taking 2 doses each day, one in the morning, the second after training or between meals on non-workout days. Capsule shell (Gelatin; Coloring agent - titanium dioxide, E131), Anti-caking agent (Magnesium salts of fatty acids). Testosterone booster. It inhibits catabolism, improves anabolism and speeds recovery. It is one of potentially the best prohormones. Effective support for testosterone balance in the body. High-quality choline as Alpha GPC. Enhances cognitive functions and physical performance. Dietary supplement supporting the production of growth hormone. It accelerates regeneration and facilitates sleep. Creatine citrate is formed from the combination of creatine molecules and three molecules of citric acid in one molecule. It is a substance soluble in body fluids, more soluble than creatine monohydrate. Ionized citric acid (citrate) is involved in energy conversion, by acting in conjunction with creatine, increases this potential and gives the compound an additional properties. Creatine citrate, when used systematically, effects the energy storage, supporting the exercise capacity (strength and endurance) and increase of muscle mass. It has a regenerative ability through a pH, return to ATP balance in combination with anabolic activity of kinases activated by creatine. Due to the responsibility of the hormone insulin for the transport of creatine into the muscle cells, it is desirable to use creatine during meals or by the use of supplements (carbohydrate, carbohydrate-protein, insulin-like) and citrate creatine mono-preparation and multi-compaund supplements and as supplement to creatine stacks. 2) constant supplementation: 0,03-0,05g per kg body weight for an extended period of time. Creatine gluconate - a combination of a molecule of creatine and glucose, increasing the bioavailability of nutrients from the digestive tract into the bloodstream and from there on to muscle cells. Used in creatine supplementation, recommended for physically active people and athletes practising strength and strength-endurance sports as an element of increasing the exercise capacity and as component supplementing the diet, enhancing anabolic and anti-catabolic potential of creatine. Creatine has also ergogenic potential. The use of equivalent doses guarantees an increased strength, lean body mass and improvement of body composition and body aesthetics. On the market supplement it is available as a component of the advanced pre- and post-workout preparations. Dosage: 1-3 g per day, pre- and post-workout (customarily in sports supplementation). Creatine ethyl ester (CEE) - Creatine with strong anabolic, catabolic and erogenic potential obtained through esterification, to obtain a higher bioavailability of creatine, and thus reducing the value of its individual doses. This results in lower weight gain than during use of special forms of creatine but better quality. Creatine ethyl ester is used in sports supplementation to obtain improvement in exercise capacity (strength and endurance) as mono-preparation supplement (in tablet form) or as a nutritional supplement (creatine stacks) and pre-workout supplements. Buffered creatine monohydrate is a special formula combines creatine monohydrate with the so-called "Buffer", which is a chemical compound that allows to obtain the proper pH of the solution, the aim of its development was to eliminate the conversion of creatine to form creatinine. The formula is modelled on the patented Kre-ALKALYN formula. Buffered creatine monohydrate improves the exercise capacity (strength and endurance), accelerates the growth of lean body mass, and provides extensive wellness after exercise. It is available as both a mono-preparation supplement in a form of capsules (rarely as powder), as a basis or supplementation of creatine stacks. Dosage: in professional sport recommended 2.5-7.5 grams per day, depending on the intensity of the workout. Kre-Alkalyn (buffered creatine monohydrate) is a patented formula of creatine, operating with better effect in smaller doses than other forms of creatine (creatine monohydrate). Use of kre-alkyn does not store water in the intercellular spaces, and muscle cells, its use provides full transportation (without support) into muscle cells. With its application, there are no digestive disorders. Kre-alkalyn regularly used enhances the exercise capacity (strength and endurance) and accelerates the growth of lean body mass. Used after exercise affects the rapid renewal of cells and reduces the feeling of fatigue. It is often used by athletes, despite the higher price then other complexes of creatine. It is available as mono-preparation supplements (capsules, and powders) as well as the complementing of creatine stacks. Dosage: as recommended by the manufacturer 2.5 - 5g / 24h. Alpha-ketoglutarate creatine is an intermediary product of the Krebs cycle, the salt of glutaric acid and creatine. It has a high ergogenic (glutaric acid) and anabolic (creatine) potential. Used in a combination - enhance the effect (synergism). The use of regular Creatine alpha-ketoglutarate increases remarkably exercise capacity (strength and endurance), accelerates the growth of lean body mass and enhances recovering after a hard workout. On the Polish market is available only as a component of creatine stacks. Dosage: usually 4-8 grams per day, mainly before- and after of training. Orotate (synonyms: tri-creatine ororate, di-creatine ororate), is formed from the combination of molecules of creatine and three or two molecules of orotic acid in one molecule. Orotic acid (vitamin B13) belongs to the group of water soluble vitamins, is involved in the metabolism of folic acid (vitamin M) and vitamin B12. It occurs in plant origim products. It cure multiple sclerosis. It affects the production of energy through the increase of uridine monophosphate (UMP) and the level of 5-phosphoribosyl-1-pyrophosphate (PRPP), increasing storage of glycogen in the muscles. Creatine (β-methylguanidoacetic acid), it is an endogenous substance, synthesized from the acids present in liver and kidney (L-arginine, L-glycine and L-methionine) and the consumption of meat. Its operation provides a level Adenosine triphosphate (ATP), which is an energy carrier, increases the hydration of cells and muscle glycogen stores. In the sports supplementation, creatine is stored in the muscles, which improves energy management, exercise capacity and quick recovery and muscle growth. It has the ergogenic, anabolic and anti-catabolic potential. A combination of these components with the systematic application increases the functional capacity (strength and endurance), increase lean body mass and accelerates of the recovery of the body after exercising. Because of the anabolism of insulin, increasing creatine transport into muscle cells, it is recommended to combine it with supplements that increase insulin sensitivity (and insulin-mimetics). Orotate, is used by athletes practising strength sports, is available as mono-preparation supplements (powders, capsules) or as a base component of the creatine stacks at www.muscle-zone.pl.